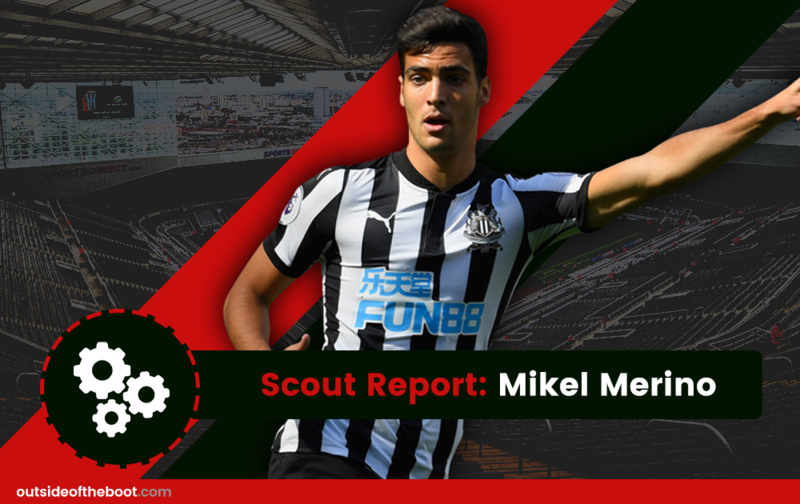 Josh Sippie lays down the law on Newcastle’s metronomic Spaniard, Mikel Merino. Borussia Dortmund are another one of those teams that just has an eye for young talents, no matter where they may spring up. When you are a top European side who has, at one time, boasted internationals from the USA, Armenia and Gabon, you leave no stone unturned. Dortmund are fantastic in giving their youth players the chances the deserve. They were once the best hope the Bundesliga had of challenging super club Bayern Munich and while they fell on relative hard times recently, they seem to be right back in the mix going into this year. Yet, while Dortmund certainly leave no stone unturned, they didn’t have to dig too far to find Mikel Merino. If Germany has become famed for their ability to produce towering central defenders, Spain holds the same honor, just with intelligent passing midfielders like Merino. He will be spending the year at Newcastle United on loan, where he is already basking in chants of “better than Cesc Fabregas.” With the increased playing time he’ll receive with the Magpies, there’s no telling just how high the ceiling will be for his first (and hopefully not the only) year in the Premier League. Mikel Merino Zazon was born in Pamplona, Spain on 22nd June 1996. He began his youth footballing career at CD Amigo but was scooped up by Osasuna, where second team coach Javier Lerga is known for the chances he hands to youth players such as Merino. It just so happens that his father Angel also played with Osasuna and later managed there as well. Merino started to get noticed during his time with Osasuna, as it was there that he was faced with stiff competition from his fellow youth midfielders uncovered by his club. It took just 18 months from his second team debut in 2014 for him to be given his chance with the first team, where he was handed the No. 8 jersey. Merino jumped from making just five appearances with the second team to becoming a regular, with 29 appearances in the first team. In that all-important first year, he was an integral member of the squad keeping the club from being relegated. The following year was his big breakout campaign, as he made a whopping 35 appearances and netted himself six goals, all at the age of 19. He was instrumental in Osasuna’s playoff run, netting himself three goals in their push for promotion. When he signed for Borussia Dortmund in 2016, it was plain to see why. He had grown by leaps and bounds and needed that next level of competitive football to reach his full potential. But with first team appearances hard to come by, he secured a loan to Newcastle, where he is locked and loaded for the biggest stage. While Mikel Merino hails from the Spanish factory of creative midfielders, his usefulness doesn’t stop there. Merino is just as comfortable sitting and defending in front of his own box as he is attacking on the edge of the opponent’s box. He fits into that category of midfield pivots, like what Santi Cazorla became in his later years. He is proficient at winning the ball back with well-timed tackles and the transition from winning the ball to turning it into an attack is often seamless. It’s no secret though that while he is solid on the defensive side of things, it’s in the attack that Merino’s style really comes to light. He is capable of pressing the ball up field and using his own two feet or using his Xabi Alonso-like long passing to pick out teammates all over the pitch and stretch the defense. When it comes to a final product, Merino delivers as well. He is always a threat in the air from set pieces given his tall stature (187cm) and uses this aerial ability to both nod the ball home himself or set up team mates for their own crack at goal. Merino is a midfield hub of sorts. You can slot him into any central midfield role and he will prove more than capable of living up to the expectations of the role. Passing has always been the biggest strength of Merino. He boasts fantastic passing numbers throughout his career when it comes to both short passing (89%) and long passing (80%). He is a creator, simply put, and no matter where he finds himself on the pitch, his primary objective is to create, and he does so very effectively. Merino also handles himself well in front of goal, something that we should be seeing much more of with increased playing time at Newcastle. He is a smart shooter, as he won’t fire Paul Pogba-like long balls into the 53rd row, but if the lane is open, he is capable of punching home with either his feet or his head. Technically, Merino is astute as well, even in spite of his height. He is calm over the ball, especially within the box, and is capable of whittling away at defenses, as he patiently waits for the right opportunity to present itself, be it an open shot at goal or a charging team mate. That transitions into another strength of his, that being his patience. He is so calm over the ball, that it might at times look like he is disinterested, but like Mesut Ozil, that is just because he is calculating what his next move will be. And for any of the stray claims that he is disinterested, Merino is superb at tracking back and making smart, safe tackles to snuff out opposing attacks. With Merino’s diverse range of skills, all of which range from good to superb, the only real weakness that can be perceived from his game is also one of his strengths. That calculating patience that he shows over the ball is a blessing, but it also has its drawbacks. He can, at times, wait too long and allow the defense to re-sort itself when he could have pressed the issue and made things uncomfortable for them. This applies as well to his willingness to fire off a shot. Merino is a good goal scorer, but he has a similar problem to Mesut Ozil. Sometimes the best thing to do is to have a whack at the goalie and see what happens rather than sit on the ball and wait for something to unfold. If Merino can shake off his desire to ensure that a shot is worth it, he can score consistent goals and give defenders even more to think about.